Hundreds of events are taking place in Normandy to mark the 60th anniversary of the D-Day landings, the start of the invasion which eventually liberated France from Nazi occupation. BBC News Online is travelling around the region to see how people are marking the day in their own way, and correspondents from across the BBC log their thoughts from the main commemorative ceremonies attended by world leaders. The cafes and restaurants that line the cobbled Rue de la Mer are filling up with people exchanging stories after a long day. Robert Taylor, 83, is sitting with his son Robert, enjoying a drink. The Commando veteran, who has lived in Germany for 44 years, had tried to find his German father-in-law's grave but they were buried three or four deep and they have had no luck tracking him down. 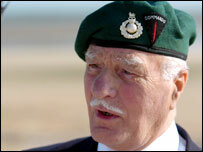 Mr Taylor, who stormed Sword Beach, said: "I wanted to lay a wreath, irrespective of who they are." Looking ahead at future anniversaries, he thinks there is a danger the interest will die out as the veterans pass away. He said: "It should be impressed on the younger generations there are dead-beats like me who did a little bit to try and make the world a better place, although it's hard to say whether it is actually better or worse. "I hope it's kept alive so children can learn from it and be better citizens." Nearly everyone is holding a flag, so it is no surprise to find the souvenir shop on Place de 6 Juin has been doing a roaring trade. Tony Groult, 30, has come from Paris for the weekend to help his father on the busiest days of the year. He said flags and postcards make up 60% of the day's trade and 150 bottles of special D-Day anniversary wine have been sold. The town's main streets seem to be emptying out and there is a feeling the day is winding down. In the main square hundreds of people are watching a big screen relaying pictures from the British ceremony at Bayeux. 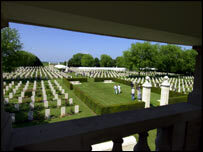 But there is a predominantly Canadian feel to the town, due to the proximity of Juno Beach. Earlier, there was a ceremony for Canadian veterans, watched by Andrew Rebsamen, 42, from Basle in Switzerland. He said: "All the events I've watched have been very emotional and human. 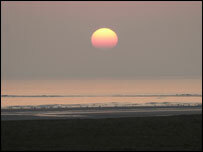 I also took a remembrance ramble along the coast to Asnelles, where I watched a landing exercise by the British Army." Canadian veterans are receiving their anniversary medals at the picturesque cemetery where more than 2,000 of their fellow countrymen are buried. Eileen Harris, 78, from Calgary, collects her insignia on behalf of her husband James, who landed on Juno beach on D-Day but died five years ago. She said: "I just can't express how I feel, it's wonderful. "I wanted to come because I thought this would be my last chance. It's been hard on me but I'll get through it - he did and so will I." Deputy Mayor of Reviers, Karine Messiers, told the veterans: "You can return to Normandy anytime. It is your home." There are a lot of smiles on the faces of the world leaders, despite the strains around. Perhaps Russia's President Putin was the only one I saw without even a hint of a smile on his face. Under the surface there are these strains, but everyone is talking now about a rapprochement, though things still need to be agreed regarding Iraq. There's a general acknowledgement that this is the last big anniversary, but it is still the veterans who have come foremost, now as then, as they accepted their honours here today. And it has been a good sight to see. George Kirkby, 80, and his three sons have stopped for a break after being prevented by police from getting to Pegasus Bridge, where they were hoping to visit the museum. Tight security has followed the world leaders throughout Normandy. But Mr Kirkby, who served in the Combined Operations and lives in North Wales, has had a good day, having been on the HMS Campbelltown in Caen and met the First Admiral, Sir Alan West. He said: "That was the jewel in the crown. He stopped to speak to me and he was a really nice bloke." 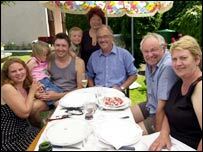 The Flambard family in Blainville-sur-Orne are having a barbecue in their garden to celebrate the D-Day anniversary. They were hoping to have a British veteran, Bryan Balsom, whom they met 15 years ago, as their guest but he was too ill to travel to France. 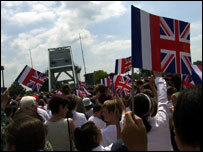 Jacques Flambard, 66, remembers the celebrations the day the British liberated the town. He said: "The military gave chocolates to the children and corned beef to the French people, who gave them butter and fresh produce in return." The Germans banned listening to the radio and set a 10pm curfew, he said. But the liberation was tinged with sadness because Mr Flambard lost his brother, 22, in the bombing of Caen. Pipe bands, marching bands and buglers have been playing for the veterans on the streets of Arromanches and in the skies above there have been military fly pasts with fighter jets trailing plumes in the red, white and blue colours of the Allied nations. Security around the main events is so tight this afternoon that many veterans will simply have to watch the international commemorations on big screens put up for the occasion. For most though, the main reason for being here this weekend is the chance to meet up with old comrades and to remember the friends who never made it home. The veterans will be watching closely this afternoon to see what kind of message will be sent out by President Bush and other world leaders at today's main event. They hope it will focus solely on the sacrifices of D-Day, rather than taking in the current war on terror. Arromanches handled tonnes and tonnes of supplies during the Normandy campaign and was a key town in the landings, and this is part of why it has been chosen for the main international event today. I think a lot of veterans wanted and needed to hear Chirac's words this morning at Colleville. These events will have been seen by a lot of American people, many of whom felt the French might have forgotten those sacrifices made to liberate France and Europe, and that this was part of the reason France was not backing America in the war in Iraq. In the run up to this important weekend, many Americans will have seen pictures of the French looking at the memorial sites and cemeteries, and they will realise that they haven't forgotten what happened and that the alliance is still strong, despite the differences over Iraq. I thought it was a moving service here, and an opportunity for the dignitaries and the veterans to remember those who didn't return from Normandy. You can see row after row of beautifully maintained tombstones - they are a national statistic of the loss, but each one is a reminder of the personal tragedies being remembered today. Veterans were very much a part of today's ceremony. There was a brief moment where veterans marched in and were for a short time soldiers again. Or they also stood on the manicured grass between the tombstones. Ten years ago it was interpreted as a snub that Gerhard Schroeder was not invited, but we have moved on. I've not met many veterans vociferous in their opposition to this, though some may have some private doubts. A parade led by a brass band includes schoolchildren, residents, veterans and youngsters from the Oxfordshire Royal Green Jackets Army Cadets. The children are waving flags with the Tricolore and the Union Jack. The atmosphere is upbeat and triumphant and well-wishers line the streets. Those sitting in the Gondree Café, which was the first residence to be liberated, have ringside seats as the parade makes its way over the bridge towards the museum, near remnants of the original bridge. Security is very tight in the village - only those with the correct passes were able to make it here. This was the first spot of French soil to be invaded on D-Day, soon after midnight by Major John Howard and his Horsa gliders. They were followed by paratroopers to defend the famous Pegasus Bridge. 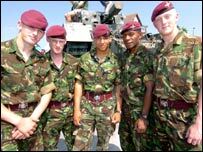 The Parachute Regiment is here as part of a battlefield tour retracing the steps taken by its founders. Private Steven Jones, 19, from Birmingham, said: "We're inspired by them - if it wasn't for them, there wouldn't be a parachute regiment. It's been fantastic talking to them." President George Bush's words here reflected the fact that this could well be the last reunion for many veterans. And he made it clear that now was a time of reflection, that these veterans will be honoured forever, both by those in the countries they served and in the countries they freed. Jacques Chirac made it very clear, in case there were any doubts on the part of the US people, that France will never forget the sacrifice of the American servicemen on 6 June 1944. He said today was a day of hope, and France would never forget the men or its debt to America. I think it was important to the American people that those words were uttered - there has been a feeling that in the last year or so perhaps France had forgotten those sacrifices. I think both speeches showed that both countries have stood together for 100 years in trying to promote ideals such as democracy and freedom. Germany, France and the US all feel it is important to promote them around the world and they stand behind that conviction. There were no references to Iraq, as we expected. If it had been mentioned it could have overshadowed today's events. 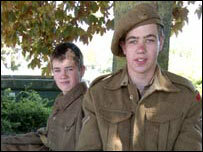 Matthew and Edward Emmett, taking a breather under a tree, are members of the Military Vehicle Trust, which brought 300 vehicles to Normandy from the UK. Matthew, 19, from Henley-on-Thames, said: "We've been driving in a convoy and it's been brilliant the number of French people who have come into the streets and said 'Thank you'. They're not thanking us personally, of course, but the veterans for their freedom." Gillie Potter, 81, is pointing to the spot where he landed on D-Day. He was hit by a mortar bomb 10 minutes after reaching the beach and spent six months in hospital. 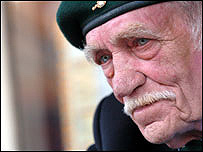 The former Royal Marine commando said: "This was our third D-Day after Sicily and Salerno, so we knew what to expect. Today I'll be thinking mostly of the loss of my friends. The mortar landed within one foot of me and killed some of them. But I've no hatred - everyone was doing their job." The village square, which has four D-Day monuments, is looking immaculately polished and groomed. Wendy and John Perry, from Brecon in Wales, are setting off in search of more information about a relative who died invading this beach. Wendy's uncle, Major John Pooley of No 3 Commando, was 25 when he was killed on 7 June 1944. Mr Perry said: "He's like the forgotten relative because the war was a taboo subject in the family and we only found out about him seven years ago. We're trying desperately to contact people in 3 Commando." The Queen will go to Juno Beach, to a centre there, to recognise the work of Canadian forces. They were the third largest group of Allied troops involved in the landings. She will then come to the Commonwealth cemetery in Bayeux, one of the largest of the 18 Commonwealth cemeteries in the region. She will walk through among some of the tombstones and you really have to have a heart of stone not to be moved by what this represents. It represents the sacrifice of the lives of many men, some of them very young, to liberate fortress Europe from Nazism. It was striking that the German leader was not invited 50 years ago, but this time he will be there at the international events in Arromanches. I think those behind these events will hope this sends out a message that while we will not forget, we have moved on and there are now very strong friendships and bonds with Germany. Six young French arrive at the beach after travelling from Rouen. They wanted to visit Ouistreham to meet some of the D-Day veterans and thank them for what they did. Julien Mathoux, 25, a librarian, said: "We are the last generation to have grandparents who could talk to them about living in the war. They tell us it was the first time they drank tea but there are things that are too difficult to talk about. The veterans were the same age as us when they came to our country for liberty and I hope we would do the same." Sunrise and the beach is empty. Sixty years ago to the second, this horizon was filled with the Allied invasion armada and the sight would probably have struck fear into any Germans standing in this spot. The only people here now are French police patrolling the monument where President Jacques Chirac will attend a ceremony this afternoon.